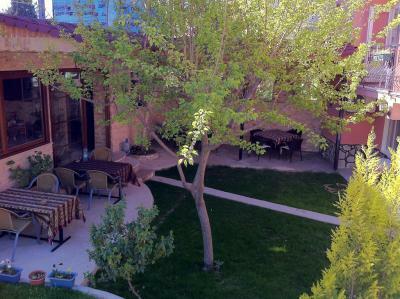 Set in a green garden, Sinter Terasse is only a 15-minute walk from Pamukkale ancient city. This family-run property offers free WiFi and air-conditioned accommodation with a TV. Rooms are decorated simply. Certain rooms have a view of the garden and a flat-screen TV with satellite channels. Some rooms come with a balcony. Guests can enjoy à la carte restaurant. Room service is available at the property and breakfast in the room is also offered. Guest can get help from the tour desk to organise a trip. Currency exhcange and concierge service are available at Sinter Terasse while free public parking is available at a location nearby. The ancient metropolis Laodicea is 11.6 km from the property while Denizli Cardak Airport is 69 km away. One of Pamukkale's best-loved hotels, Hotel Sinter Terasse is recognized as one of Pamukkale's leading hotels with gracious Turkish hospitality, thoughtful amenities and distinctive .